10c Fiji Flying fox (bat). $2 Peregrine falcon ("The Islander", a subspecies found only in Fiji). These names are all given in the local language on the coins. Interestingly, the reverse designs of the coins stay AS THEY WERE. Since the 2 dollar coin is new, the tanoa from the old 1 cent coin has been used on the reverse of this design. Just magnific! How to have it? Does fiji can make coins without the queen's effigy? It will not be released until 2013. Maybe in May or June you will find it for sale on coin dealer web sites. Fiji became a republic in 1987. However, Fiji was still a member of the Commonwealth, and the Queen is head of the Commonwealth, so that was a reason to keep her effigy. However, independent Fiji was never required to use her effigy. Jamaica does not use it, for instance. Fiji was suspended from the Commonwealth in 2009, because the President would not agree to hold democratic elections. I'm in Fiji right now, and in half a day I've wound up with a mix of coins. 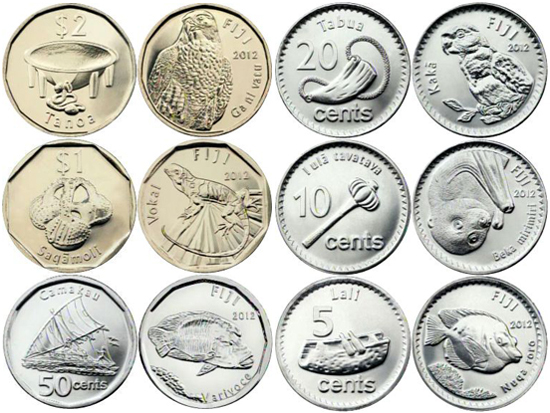 5-cent with the Queen, 10-cent with the flying fox, 20-cent with the Queen, 50-cent with the Queen, and $2 with the falcon. The Queen ones bear mint years of 2009-2010; the critters are all 2012 (available in 2013). I'll have to try to make lots of little purchases so as to get more coins.